Did you know there is an official football of collegiate tailgating? I didn't, but I am so glad I know now. 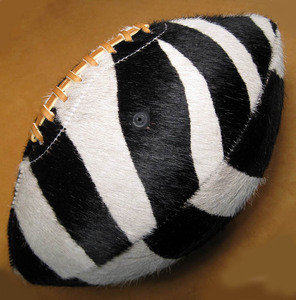 Introducing the "Handsome Dan" football, made by Leather Head Sports, and named for the Yale University bull dog mascot. I was recently introduced to Leather Head Sports company and owner Paul Cunningham. Paul is what I would consider a master craftsman. 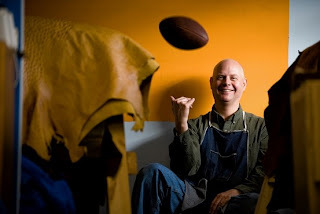 He started making leather sporting goods in 2006 as a part-time passion and hobby. He has since left his job as a photo editor for Major League Baseball to concentrate on his leather craft full-time. 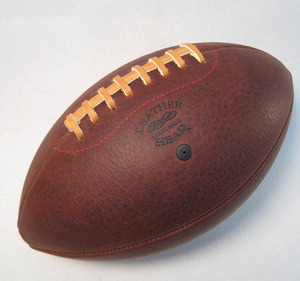 His best and most famous (check out the Bradley Cooper pictures) leather good is the "Handsome Dan" football. What makes this football so different from the typical Wilson regulation football is that it's a lot easier for fans to throw and manage. Paul designed the ball for "an average-sized guy" with "an average-sized hand". Which is why this football is particularly popular at tailgates. It is made from rich, supple leather, and ages beautifully. He also has some unique custom creations like the silver and zebra pattern footballs above. I like that he can custom engrave a team name or message onto the leather. Makes for a perfect gift. I was curious about Paul's tailgate and gameday traditions so I asked him some questions on my favorite subjects. Here are my questions and his responses. Being that I'm from the home of baseball, Cooperstown, NY, I didn't grow up with a lot of football tailgating traditions. My father graduated from Yale in the early sixties but he grew up in Wisconsin, so our family loyalties leaned toward the Green Bay Packers. I attended Drew University, in NJ, which doesn't have a football team. However, my wife Michelle is a Tar Heel who bleeds Carolina Blue. She and both her parents graduated from UNC Chapel Hill so Carolina football and basketball dominate the TV in our house. What are your tailgate traditions? Both the NY Jets and the NY Giants play in the Meadowlands, just a short drive from my home and we try to get to a couple of games a year. Being so close it's easy to pack up and kick the party off in the Meadowlands parking lot. One of my favorite things about tailgating, is that I get to break out my Grandfather's Hibachi grill. It's an old cast iron grill that's about 60 years old. It's the perfect size for tailgating. It's true that they don't make them like they used to. Also, once a year my wife Michelle and her Tar Heel sorority sisters plan a homecoming weekend in Chapel Hill with the families. Nothing compares to college tailgating. We're older now and we all have our own kids, but it's great to relive our youthful college excesses during homecoming weekend in Chapel Hill. A tailgate party needs to have a ball to toss around but I always felt that an official size ball was too big for me to grip and throw. 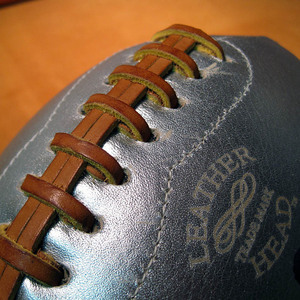 In my mind I always imagined a football made from beautiful natural leather, but sized for my own hands. With the birth of the Leather Head football, I finally had the ball that I always imagined. What is your favorite tailgate recipe/food/drink? I am a dedicated student of real southern BBQ. My smoker gets more work than my grill, but on tailgate day, my go to recipe is for grilled Jamaican jerk chicken wings. I love them hot and spicy, but to appeal to a tamer crowd, I often tone down the heat. By substituting mild green peppers for the traditional Habanero pepper, I get a deliciously flavorful wing that the kids can eat too. Mild jerk marinade for chicken wings, ribs and such: 1 teaspoon (freshly) ground allspice½ teaspoon (freshly) grated nutmeg½ teaspoon ground cinnamon¼ teaspoon garlic powder1 tablespoon salt.½ cup chopped scallions (green and white parts).1 green pepper chopped(if you prefer it spicier, substitute a few Jalapeno or Habanero peppers)½ cup distilled white vinegar¼ cup soy sauce2 Tablespoons vegetable oil Combine all ingredients in a blender and process until liquefied.Pour over wings and let marinate for 12 to 24 hours. (a large ziplock bag works well).Grill slowly over gas or charcoal and serve while still hot. On game day, I am so lucky that my wife Michelle is a sports fan. She's the planner and the organizer and I am the shopper and the cook. If we plan on staying home to watch the game on TV, we'll usually have friends over. If we have tickets, the preparations are similar, we just make things mobile. Typically, the day before, Michelle will suggest a few menu items that she might like. The morning of the game, I can be found chopping, mixing, stewing, and baking. As game time approaches, I grab my first beer of many and collapse into a chair. Once the game starts, I often find myself grilling, and fetching beers. Sometimes, I even get to watch the game.